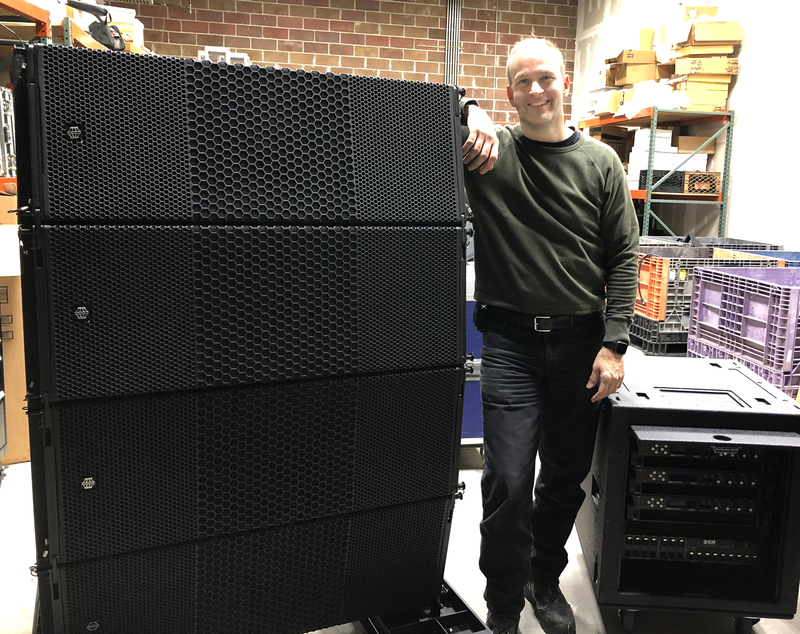 Long Island-based production house takes delivery of first EM Acoustics HALO-A line array in the U.S.
Long Island-based Taylor Productions has taken possession of an EM Acoustics HALO-A line array system – the first delivered in the United States. The new system is made up of 16 HALO-A line array modules, six MSE-218 ground and six MSE-218F flyable subwoofers. Shortly thereafter EM Acoustics announced the development of HALO-A and Taylor came on board as the first owner of a system in the United States. The HALO-A follows the same core design as the more compact HALO-C providing the signature EM Acoustics “maximum headroom” design approach that ensures consistency of performance regardless of SPL level. The compact enclosure (14.3/362 x 40.2/1020 x 24.4/619 in/mm) and low weight (145.2/66 lbs/kg) translates into less truck space used and smaller motors required. The element also utilizes a proprietary patent-pending emulation manifold, which combines the energy of four 3.4-inch diaphragm, 1.4-inch exit compressions drivers into a plane-wave array. This assembly gives not only a significant moving area for the high frequency section but also provides twice the headroom of comparable systems. A single HALO-A exhibits a flat, free-field frequency response from 48 Hz to 19kHz (+/-3dB) and a phase response which is +/- 20 degrees between 150Hz and 18kHz. Due to the unique loading technique applied to the low frequency drivers, combined with the high frequency waveguide, the dispersion pattern control is maintained down to 250Hz. Taylor powers the HALO-A system with EM Acoustics’ FIR-enabled DQ20 advanced system amplifiers.